The passing of warm summer months signifies the beginning of cool nights, and the infusion of the warm colors of fall. It’s time to replace light summer fabrics with cozy pieces that are perfect for snuggling up with a great book and a warm cup of tea. Here are some of my fav inspiring decoration ideas for your home! You can even include the kids in your creativity! To make this arrangement, choose your favorite pumpkin (I like the flat-bottomed Fairytale) and pick up some violas, pansies, red and green leaf lettuce, thyme, and rosemary to decorate. Clean the pumpkin, cut a hole in the top, and scoop out seeds. Line with aluminum foil or a plastic bag, and fill three-quarters full with potting soil and plants. I use violas and pansies. Topped with silver serving pieces, pale gray and green pumpkins add interesting height to your buffet. This is a great conversation starter! Your guests will appreciate your creativity! Vertical displays make a big statement at the front door. Tucking in cool-weather edibles such as ornamental flowering cabbages, kale, and bay leaves adds a distinctive twist. To create topiaries, sandwich bay wreaths between pumpkins stacked in concrete urns, and top with a small pumpkin. Scented votive candles are inexpensive, mood-setting, and available in a variety of perfect colors for decorating your home for fall. 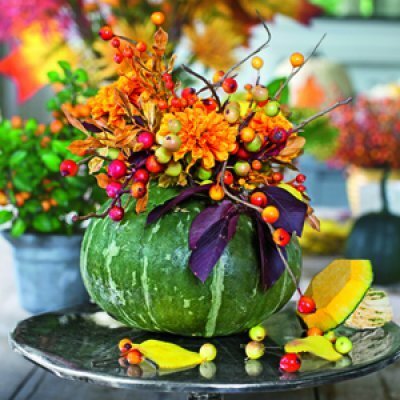 Plus, all your favorite fall scents can be brought inside with these simple decorative items. With the delicate glow of flickering candles, you can add a touch of sophistication and relaxation to your home, while infusing the air with the seasonal aromas you love.Transform mini pumpkins into luminarias by cutting a 1-inch-wide circle into each pumpkin, scooping out the centers with a tablespoon, and inserting votive candles. My kids love helping with this project! Gold metallic paint gives ordinary pumpkins a wow factor. Stick round labels on a pumpkin and trace the shape with a pencil. Remove the labels and paint inside the traced circles with gold paint. For another effect, apply labels to pumpkin, and then cover entire pumpkin in gold paint. Remove the labels when paint is dry. Get crafty this fall with our DIY fall planter. Simple clean out your pumpkin and add a small vase or even soil and add your favorite fall finds from outside! OK– you might need to visit a nursery for extra special additions to your arrangement! You’ll have a finished (and impressive) arrangement that should last about a week. One of the best things about fall is the glorious flowers that are in bloom. Chrysanthemums are a staple for fall decorating, so be sure to add them both inside and outside the home. Place them in front of the fireplace, on mantels, or beside end tables. Be sure to select mums in autumn colors, such as rust, yellow, and amber. 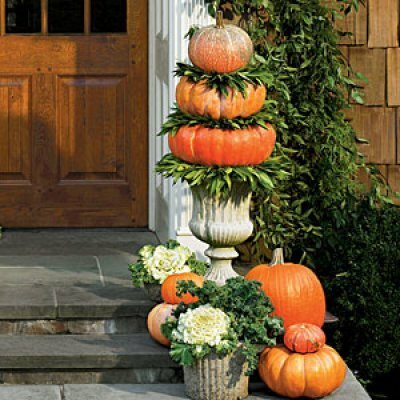 Pine cones are all over the ground outside, so head out and gather an armful for indoor fall decorating. Place them in baskets by the fireplace, or mix them in with a display of pumpkins, candles, or flowers. This is a very simple and FREE way to decorate for fall. Nothing says fall like pumpkins and gourds. Since they are available at an affordable price, buy several mini pumpkins and small gourds, and use them as colorful centerpieces. Group them together in wooden baskets, or even hollow out the center of a few and use them as unique candle holders as shown above! Place these inexpensive items all around the house for truly beautiful look. When it comes to fall decorating, it’s all about the fabric. Heavy fabrics mixed with autumnal colors are the perfect fit for fall. Warm brown, deep gold, rustic burgundy, and apple red are must-have colors this time of year. When in doubt, simply look outside to see which colors are present in nature. They are, after all, the perfect inspiration! To decorate for fall with fabric, add a fluffy blanket over a chair or ottoman, add fresh color with new throw pillows on the couch. Add a new slipcover to the sofa, too, for an instant room makeover. Decorate the dining room a new table runner or colorful tablecloth, and be sure to add a pretty place setting for each chair. An easy solution to an empty corner of the room is to a mix-match of apples. Place green apples and red apples in a wicker basket or bin, and watch an otherwise empty space come to life. Hoping I have inspired you to get busy warming up your home this season! Easter and Spring Tablescape Ideas!